Mickey Mouse has been a fan favorite of kids of all ages for over 90 years now. 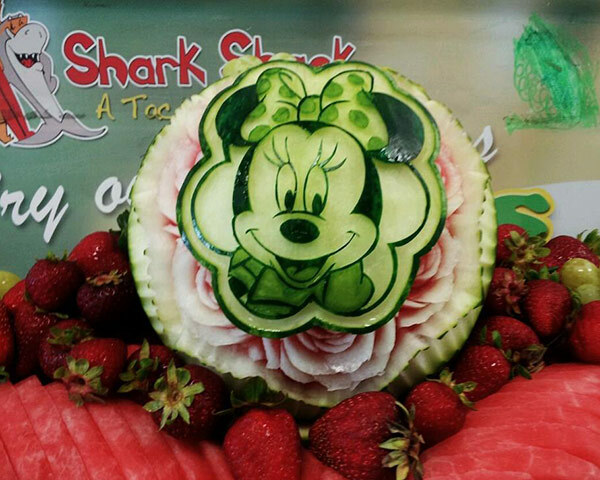 Take a look at many ways that some of our customers who have been students of our lessons, have created Mini and Mickey Mouse watermelon carvings to celebrate birthdays and special occasions. 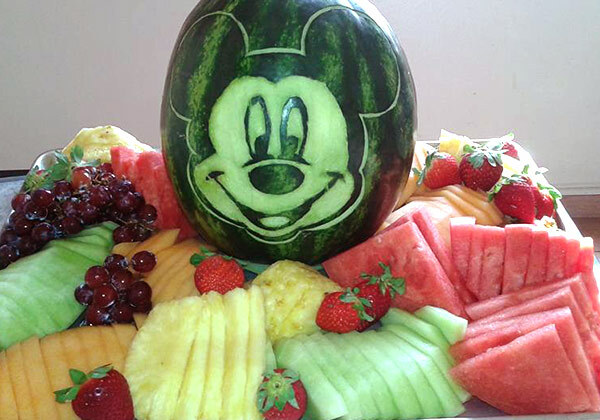 Whether you use your Mini and Mickey Mouse watermelon carvings as fruit tray centerpieces, table decorations, vases, or fruit bowls, these photos are bound to give you inspiration for your own creations. 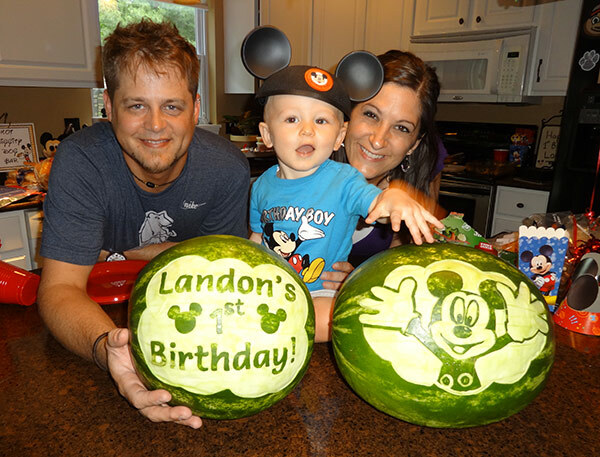 Customer turned Pro carver, Cindy Rozich carved these Mickey Mouse watermelons for her grandson’s 1st birthday celebration. As you can see, her grandson and family loved them. 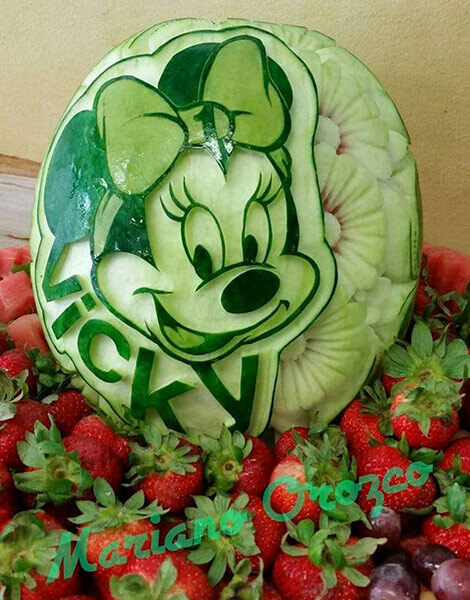 Here is a closer look at Cindy’s Mickey Mouse watermelon carving. Cindy learned how to carve graphics onto watermelons from my video lessons, Carving Letters and Words. You can too. Our Pattern Transfer Fabric makes transferring patterns and carving graphics faster and easier. The result is better looking completed carvings. 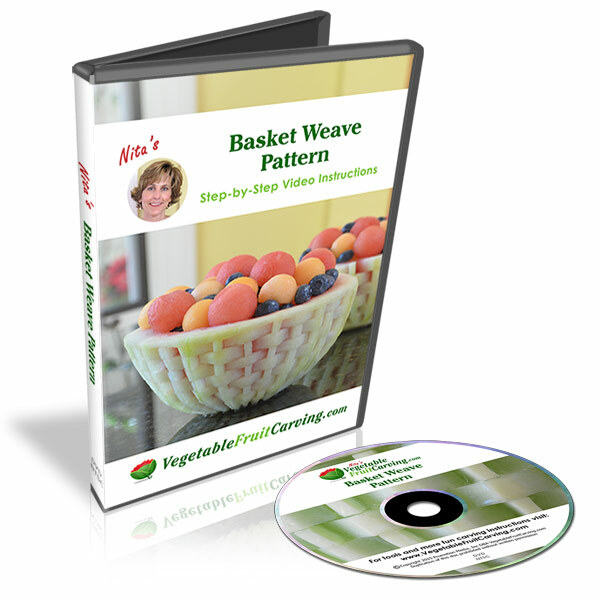 Learn more about our Pattern Transfer Fabric in our online shop. 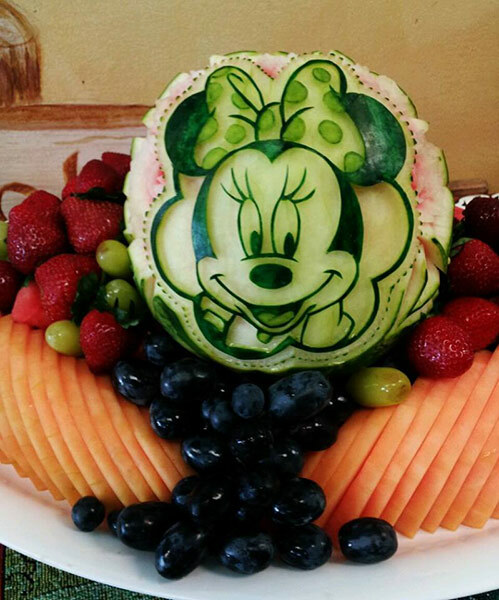 Esther Villavicencio used her Mickey Mouse watermelon carving as a centerpiece for a fruit tray. 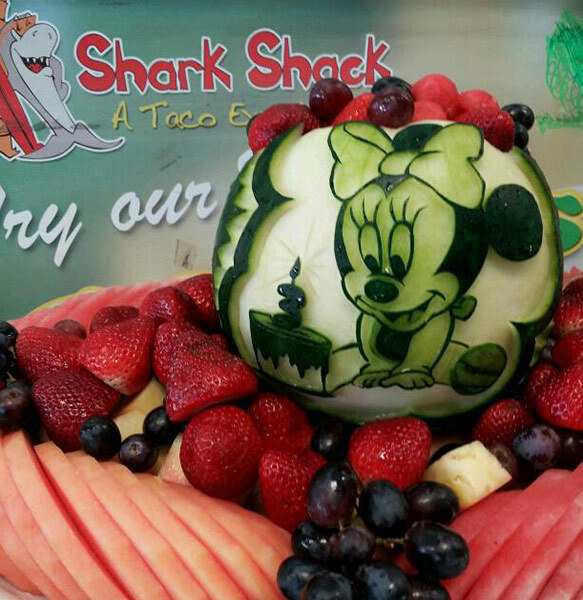 Customer/student Marguerita DeLaRosa cleverly carved this Mickey Mouse watermelon with an open top use as a fruit bowl. 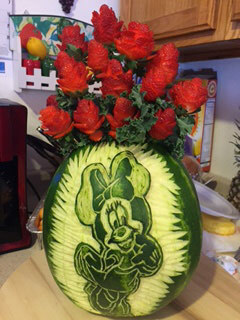 I made this for a friend, her Granddaughter had her first Birthday party and the theme was Mickey Mouse so I carved her a watermelon my first Mickey Mouse hope to make many many more now that I have the right tools. Customer and Pro carver Mariano Orozco carved both of these beautiful watermelons to decorate the food table. 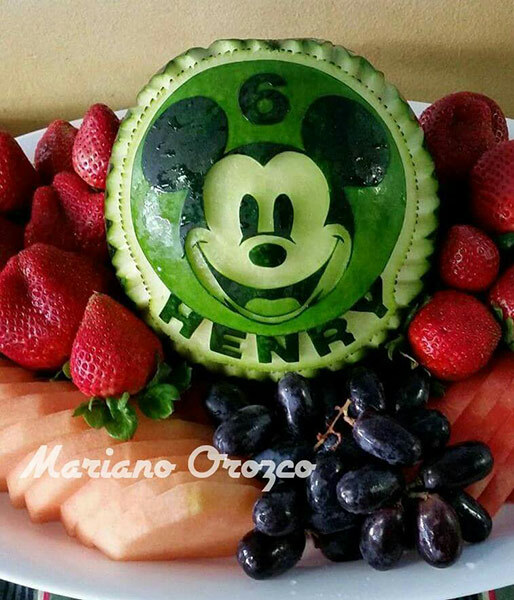 Mariano Orozco carved this Micky melon for a 6th birthday party. Let’s not forget about Mickey’s pal Mini Mouse. Mariano Orozco, who is a quite prolific carver, found many ways to carve her for special occasions. Mariano Orozco carved a very similar Mini Mouse above and below. At first glance, you might think they are the same. See if you can see the differences. These extra details can might give you ideas. 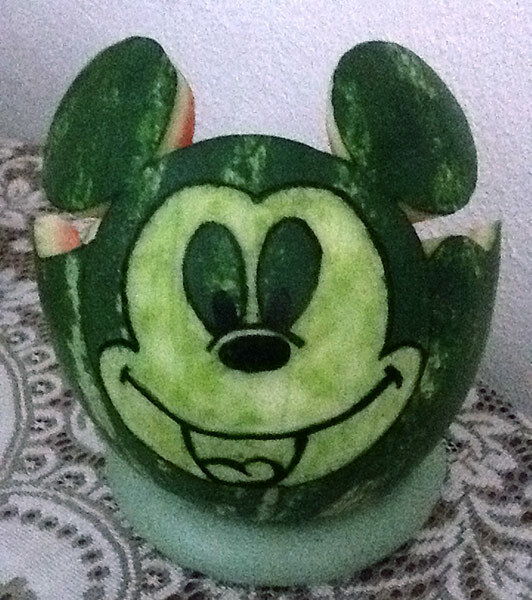 IN addition, this Mini Mouse melon also carved by Mariano is different than the one above. See the differences in some of the details? You can learn to carve roses like Mariano carved around Mini Mouse above, in our video lessons, Carving Watermelons, Roses, Buds and Leaves. Here is another great carving by Mariano of baby Mini Mouse with birthday cake. Cute graphic, right? 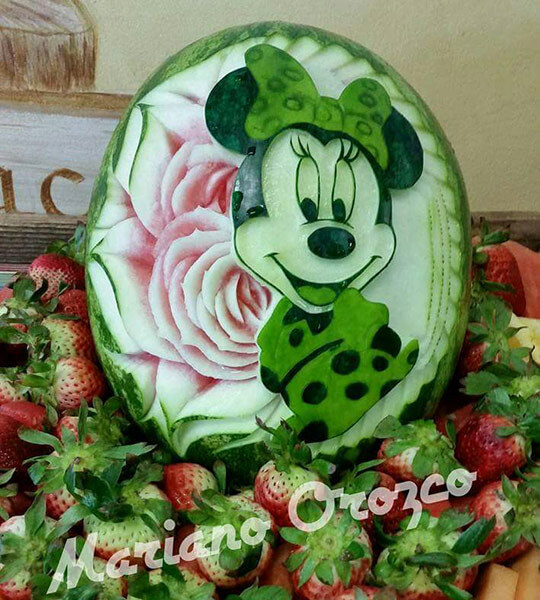 Mariano’s carvings are so well done and well photographed, that I just had to include these last 2 Mini Mouse watermelon carvings. I love the daisies that Mariano added on beside Mini Mouse’s face. Very pretty. You can get familiar with daisy carving techniques in our video lessons, Amazing Carving with Jimmy Zhang. 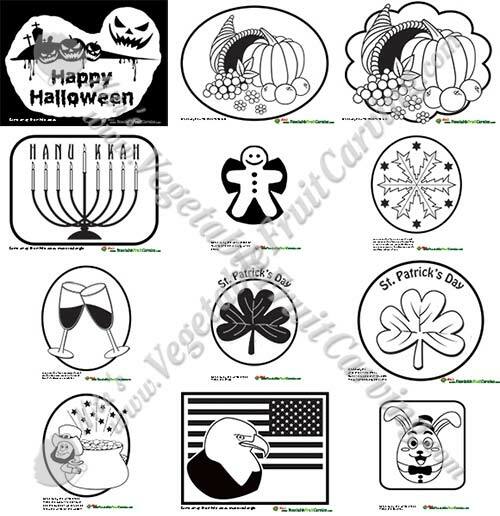 If you find yourself inspired to carve graphics onto watermelons for your upcoming special occasions, check out my video lessons, Carving Letters and Words. 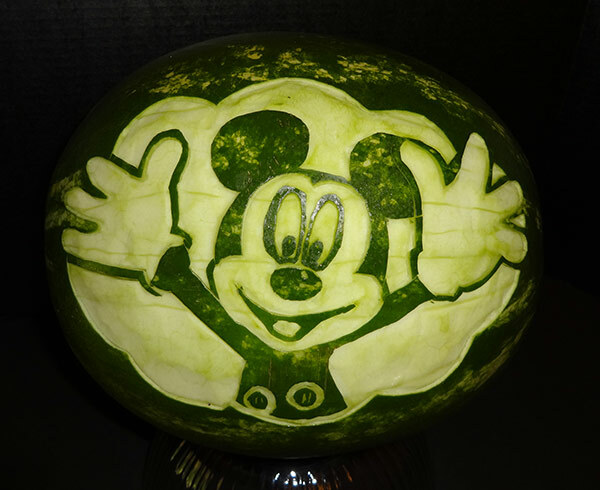 You will find our Pattern Transfer Fabric and our Thai Pro knife to be excellent tools to use with carving designs, like Mickey and Mini, onto watermelons. 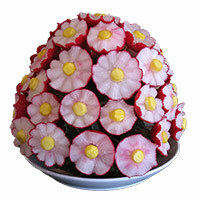 Ninoska Sanchez used her Mini Mouse watermelon carving as a vase/base to hold carved strawberry flowers. 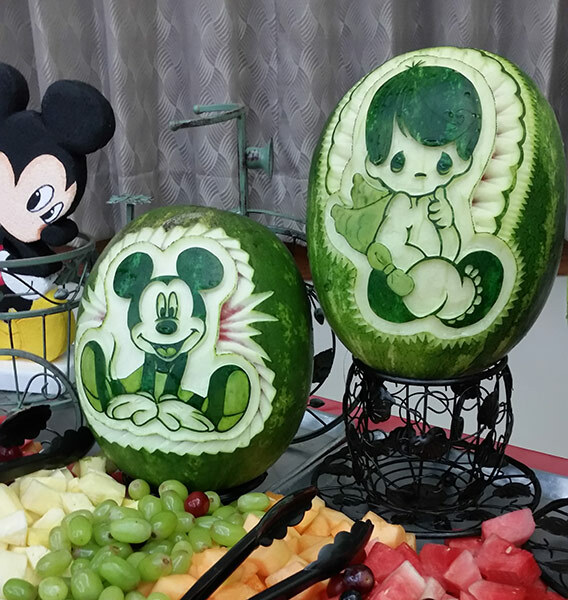 In conclusion, you’ve now seen several ways that you can use watermelons carved with Mickey Mouse and Mini Mouse patterns. You can use them as decorations for tables, as a centerpiece in a fruit tray, as a fruit bowl, and as a vase/base for carved fruit flowers, or even real flowers. Have fun making your own.